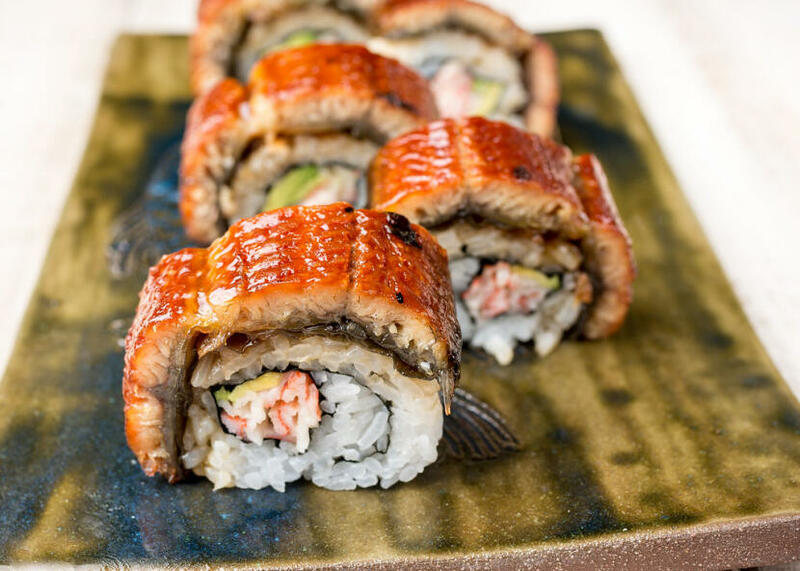 You would think that putting unagi on top of a California Roll really isn’t anything too special. I mean come on, it’s just your typical California Roll with some eel on top. You would think. You would be wrong. This roll is amazing! We first tried it at Honda-Ya when we went there for Son’s birthday, and it is really good! So of course we had to try making it ourselves. Cook the unagi as directed on the package. Cut the unagi into 1-1.5 inch wide by 2.5 inch long slices. Roll the sushi inside out, using imitation crab and avocado as your fillings. 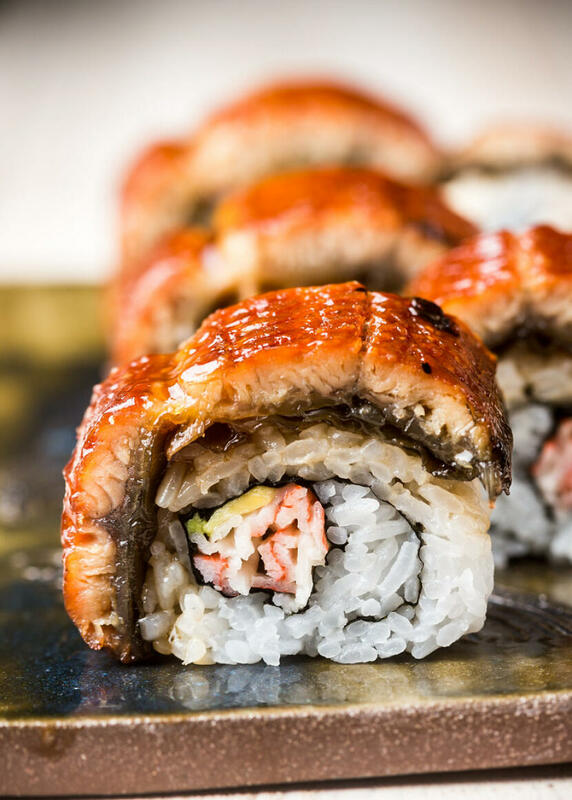 Use your plastic wrap-covered rolling mat to squeeze the unagi into the roll so they won’t fall off. Carefully cut the roll, trying to keep the toppings from falling off the sushi. I gotta tell you, I love your sushi recipes. I’m pregnant and all I’ve wanted the whole time is sushi, sushi, sushi! If it weren’t for your site I’d be so sick of eating the same rolls again and again. We have tried these in a lesson…very nice! I will stay away from the mayaonaise and replace it by chives and oignon cream cheese, just add a bit of water with it for the spread, …yumee!!! Hey Allison. Great new roll and pictures! 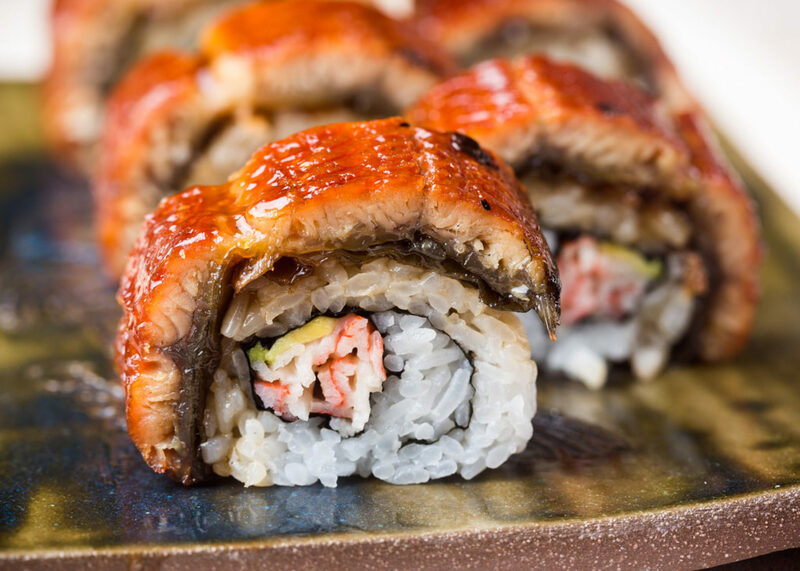 Making me hungry here… Eel has really become one of my favorite ingredients when making sushi at home. This combination sounds fantastic. Unfortunately the local Japanese supermarket was sold out on eel this week, or else I would have made this for my mums birthday party tomorrow. Thanks! I have been sushi deprived. Alicia – Thanks! I’m glad we can help… luckily we have all sorts of non-fish rolls, so there’s plenty to choose from! Manu – That sounds interesting! Karianne – Thanks! Yes, eel is definitely a yummy ingredient! Happy belated birthday to your mum! Kristen – Yes, yes, I know. You’ll get your sushi. How do I remove the bones>? I tried cooking it, but the bones still remained. thanks for the recipe. i’ll give it a shot and report back! Jay – I’ve never found bones in my unagi, so perhaps you’re getting the wrong type? I would assume you could use tweezers or something similar to pull the bones out. SavoryTV and Vegas Nightlife – Thanks! The california roll looks so good I will need to make one soon or find where i can buy some.